#ScotPublicHealth and the #PublicHealthHour emerged as an idea in November 2015, with the first Twitter only session in January 2016. We established the webinar format with tweeting in February 2016 with a session on physical activity and social media by Prof Chris Oliver. The #PublicHeathHour with Dr Calderwood and panel followed the same format – learning about a Public Health topic and use of new technologies in engaging professionals and public through social media. In addition to the panel, over 116 participants joined the session (some colleagues joined the session in groups from a single computer). Participants were mainly from Scotland, mainly from the NHS, and mainly new to Public Health hour (Webex allows users to annotate images in real time as illustrated in the images below). Asked about their expectations from the session (in the Webex chatbox), the reasons were clear: to hear the CMO talk about Realistic Medicine and Public Health (see Wordle below). This icebreaker helped demonstrate the features of a webinar while also engaging and understanding our audience better. Dr. Calderwood then took us through the main themes of the report as summarised in the following summary graphic from the report. the care of pigeon racer with lung disease receiving care at home (13 minutes into the session recording). Personalised approach to care and consent – and a reminder of the Montgomery vs Lanarkshire ruling. “Value added” healthcare – noting that we must focus on outcomes (eg for screening). Unwarranted variation (eg induction of labour across Scotland – 2 fold difference; hysterectomy – 5 fold difference across UK; length of stay post hip fracture op – 2 fold difference: these stark contrasts largely reflect differences in practice rather than different patient groups). Managing risk – great work through the Scottish Patient Safety Programme: eg hospital mortality rate is coming down in Scotland and there has been a 20% reduction in stillbirth. We also need to manage risk relating to healthcare professionals and decision making. Tired and stressed staff don’t make good decisions, and tend to over-intervene. We need to care for our workforce. Concerns about not intervening (even when that is the patient’s choice) and negligence claims. Members of the public are starting to recognise over-treatment and over-investigation at the end of life. Clinicians, when asked about the treatments that they offer patients, would often make different decisions about their own treatment (eg around renal dialysis, ITU admission). The report also references the work of Atul Gawande. Implementation of research – for example the under-use of aspirin (which is cheap and effective) while moving to more expensive drugs such as clopidogrel which are not as cost effective. Innovation in delivery of care – not just about inventing new technologies – it can equally be about simple changes. For example junior doctors filming blood taking (phlebotomy) on their smartphones and identifying 8 redundant steps; fixing the process has reduced length of stay. In the middle of the session I shared a “platform” for crowdsourcing ideas around Realistic Medicine and Public Health, under the six main headings of the report. Click on the image below to visit the page (active until 16 September). The phrasing and images are taken from the Realistic Medicine report, but the idea is to provide specific examples from Public Health – eg perhaps from Health Protection (variation in management between areas; potentially major impact on cases and contacts depending on approach to investigation and management) or screening. Many thanks to Crowdicity for providing access to this platform. The second half of the webinar took questions and comments from participants and a website called Slido, to pose questions to the panel. The first question came from Dr Peter Gordon: “can the panel comment on the inevitable tension between improvement work and over-medicalisation“. Sir Muir felt that there isn’t a tension – we need to be clear about our objectives, and ensure that our care delivers high value for individuals (eg for screening). Dr Calderwood talked about moving away from “doctor knows best”, noting differences in expectations of doctors and patients about their care. Doctors thought the patients’ main goal would be “to live longer”; however patients talked about being “symptom free and time with their families”. An open and honest conversation minimises risk of over medicalisation. Doctors see themselves as “fixers”, and often this is appropriate, but it isn’t always what is required. The CMO recounted feedback about Realistic Medicine from a GP who said that he had been practising Realistic Medicine for decades, but “under the radar”. The GP welcomed the fact that the report gives him and colleagues permission to practise person centred care. Carol Read noted the importance of listening to patients. We should challenge what we are trying to achieve with quality improvement, focusing on outcomes rather than process. She finished with a reminder that this is not about cost cutting. Sir Muir reponded first, as a Public Health professional. He noted that the term “Population healthcare” can be more useful than Public Health – which some clinicians perceive about being about “drains”! Realistic Medicine allows Public Health to engage with clinicians – have to listen to individuals but with population as denominator, rather than just those who engage with services. Also need to remain watchful – eg purpose of our service may change – and balance of prevention and treatment may change as other circumstances change. The CMO noted that there are more similarities than differences. She highlighted issues around health literacy eg around screening leaflets and medicine information: needs differ so we must personalise approach. Do we have the right people accessing services? All 6 headings in Realistic Medicine could apply equally to Public Health: for example the variation in how screening and health protection is practised across Scotland. Carol Read noted that we are all members of the public and have a lot to learn as staff. 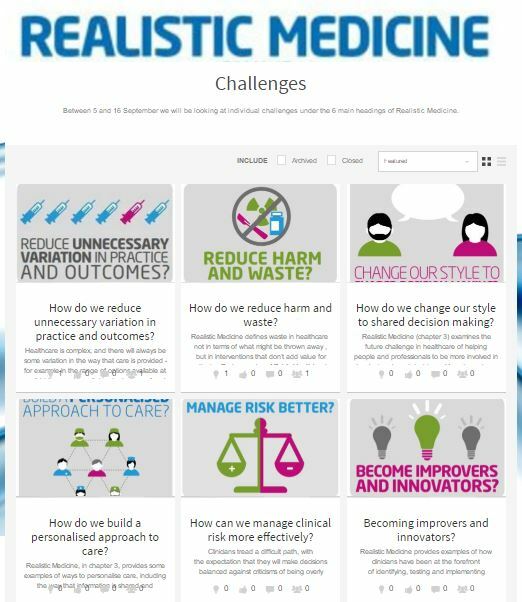 Realistic Medicine highlights the importance of shared decision making, and will require shifting of resources, both of which are directly relevant to Public Health. The third question continued the theme of shared decision making, again posted anonymously on Slido: “How can ‘shared decision making’ become a reality in Mental Health matters when declarations of ‘incapacity’ can happen when people resist psychiatric drugging“. Dr Calderwood noted the legal dimension to this scenario. Experience of families and patients would suggest that we can do things better. Families become experts. A common theme of “lack of communication with family and individual” emerges frequently in serious case reviews. The final question was opened up to participants, illustrating another feature of a Webex call (can monitor questions, and “raised hands” from the participants panel, identifying timing and priority). Mark Hazelwood asked: “Realistic Medicine’s focus on the quality of care experience at end of life is very welcome. Can we get a robust national survey to evidence how we are doing, as per Maternity?” Mr Hazelwood, CEO of the Scottish Partnership for Palliative Care, also noted that while huge progress has been made in palliative care, there has also been suspicion – eg media coverage of the Liverpool Care Pathway. We need evidence and measurement to support the case for our approach. The CMO agreed and noted that success is not just about survival, but noted that there are still questions about what we should be measuring instead. Maternity already has Patient Reported Outcome Measures (PROMS). Dr Calderwood is working with the International Consortium for Health Outcomes Measurement (ICHOM) with the aim of developing such indicators over next 18 months. Finding suitable measures is, however, a challenge when care is increasingly individualised. Sir Muir talked about a planned book, subtitled “how to avoid a bad death”. He would be very happy to talk to the press about end of life care (giving an honorary mention to the veteran Scottish publication the Sunday Post) and noted that this is the kind of conversation that should be going on in the front room of homes across the country. Everybody over age of 50 should have an advanced written plan. Carol Read drew on experience from ward/ community and the What Matters to You campaign, agreeing that there should be engagement well before, but also during the episode of care. We finished with the encouraging news from Dr. Calderwood that Realistic Medicine will be included in the medical undergraduate curriculum in all five medical schools in Scotland. In the hours leading up to the Public Health Hour the hashtag #RealisticMedicine received 200k impressions; over the course of the day the figure reached 270k impressions (from Symplur site). 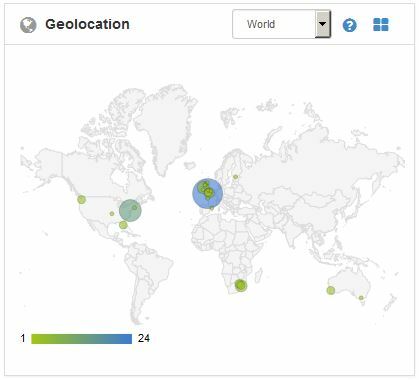 The FollowTheHashtag site showed Twitter activity across the world over the past week. The next major #ScotPublicHealth activity is at the Scottish Public Health conference, Dunblane, 27 and 28 Oct, where #ScotPublicHealth will be used as the conference hashtag. You can follow @ScotPublic on Twitter, and sign up for blog updates. Yvonne Kerr Atul Gawande book ‘Being Mortal’ very much backs up this approach, a great read and very insightful. alex stirling Some excellent examples given by Lanarkshire at the NSS Discovery event yesterday. valere white I got my book group to read Being Mortal. A very interesting discussion for many people who would never have picked this book up. If your a member of a bookgroup I would highly recommend this and spread the thinking. alastair philp @Janet – risk of what? What are the criteria we think are important? may be willing to accept more risk of one thing if gives more chance of something we feel is more important? susan laidlaw I agree Janet – I think we could be much better in communicating risk and enabling people to weigh up the risks for their circumstances. Do healthcare professionals always understand risk and what risk / risks mean to individuals? Yvonne Kerr Is also essential (in certain circumstances) to listen to views of family/significant others etc, also use of advocates etc. Particularly important when looking at care of children and elderly.